A classic blend of 60% Chardonnay and 40% Savignin, the wine’s pale white gold color comes to life with an endless stream of tiny bubbles. The nose is fragrant with white peach, freshly baked bread, and toasted vanilla. The palate delivers rich Meyer lemon and pear flavors with an accent of orange peel, all supported by a vibrant core of acidity. The bright acid sustains the finish and carries on with delicate nuances of lime zest and honeyed green apple. An ideal aperitif wine, this Crémant would be a lovely pairing for a variety of appetizers such as crab cakes, tuna poke, or a selection of soft cheeses. Tucked away on the eastern edge of France and neighboring Switzerland, the quiet Jura region has a long and proud history of producing artisan-level Sparkling wine. 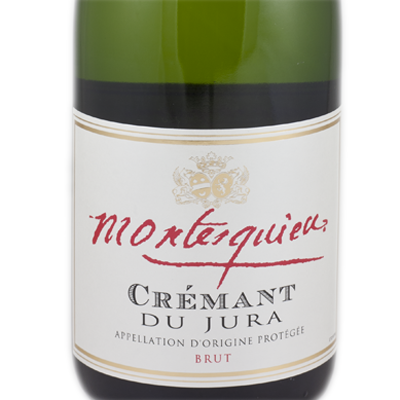 Crémant du Jura wows you with its rich creamy flavors while it exhilarates with its pulsing acid and minerality, and we are elated to showcase this unique region’s terroir with our very own Montesquieu Crémant du Jura.A classic blend of 60% Chardonnay and 40% Savignin, the wine’s pale white gold color comes to life with an endless stream of tiny bubbles. The nose is fragrant with white peach, freshly baked bread, and toasted vanilla. The palate delivers rich Meyer lemon and pear flavors with an accent of orange peel, all supported by a vibrant core of acidity. The bright acid sustains the finish and carries on with delicate nuances of lime zest and honeyed green apple. An ideal aperitif wine, this Crémant would be a lovely pairing for a variety of appetizers such as crab cakes, tuna poke, or a selection of soft cheeses.